The biggest show on earth is finally back and Bon App are ready for it! They are launching exclusive watch parties for the Bon App community. 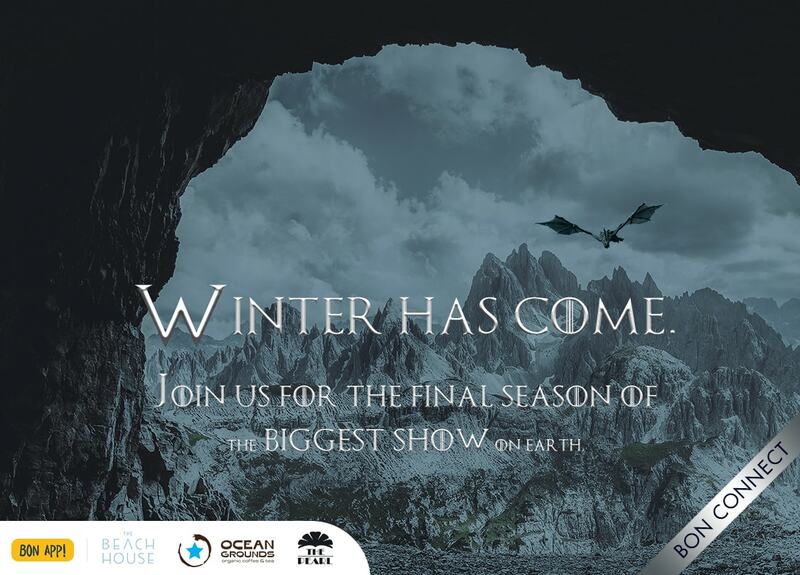 From April 15 to May 20, every Monday at 7.30pm, Bon App will be hosting ‘Winter Has Come’ Screening Parties, complete with a weekly quiz game, themed menus and of course, the show itself. At 7.30pm, they will have a quiz and at 8pm they will start the screening! Every 2 episodes will be shown in a different venue, so as to reach as many different fans as possible. Entry fee (bought on Bon App): RMB60, including one free drink. Pay at the door entry fee: RMB100, including one free drink. Instered in winning a free ticket for one of Bon App's screenings? Follow @bonappofficial on Instagram and click on the GoT post for the chance to win a free pass to all 6 episodes. Share the poster on WeChat and compete to get the most likes by the end of the week (Apr 12, 3PM). The winner will get a free pass to the episode of their choice!